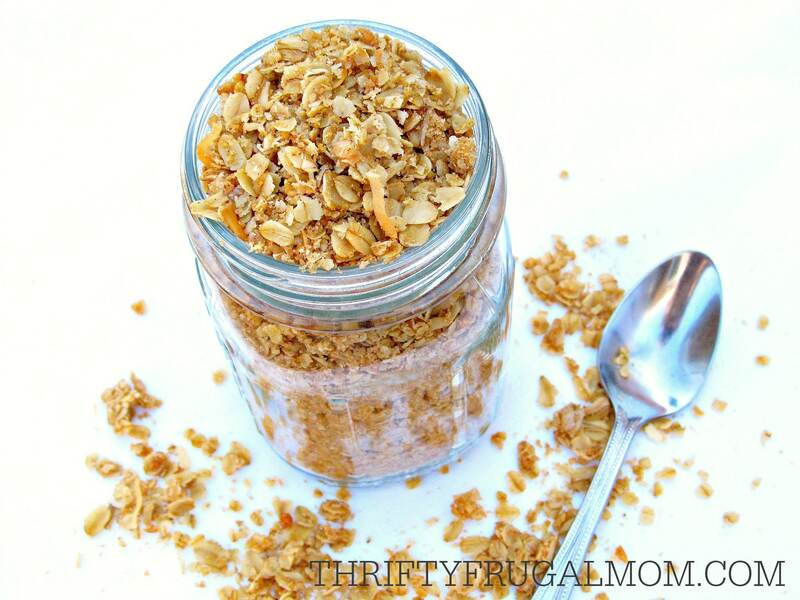 A super easy basic homemade granola recipe- perfect for a healthy breakfast, snack or parfait! Love that it uses only simple pantry ingredients and takes just minutes to mix together. It freezes well too! Back when my husband and I were dating, his family was living as missionaries in Romania, so Vince was living by himself and had to buy all of his own food and make all of his own meals. And well, let’s just say that he’s very much a minimalist and it definitely showed in his menus! 😉 So I often took pity on him and made him food that I’d send home with him when he came to visit me on the weekends. Somewhere along the way, I discovered that he really liked homemade granola. So, one week I started digging through cookbooks looking for a recipe to make for him. 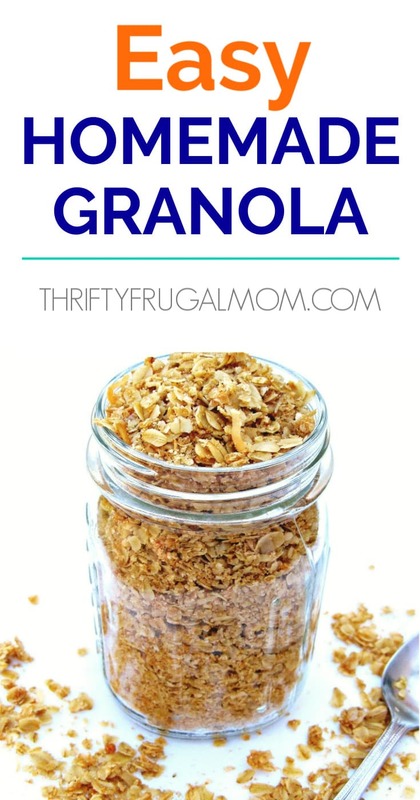 My family never ate granola and I probably only had ever eaten it a handful of times here and there at friend’s houses, so I really didn’t know what constituted a “good” homemade granola recipe. Some granola recipes looked complicated. And others, while they sounded kind of good, called for expensive ingredients. I finally came across a very basic granola recipe in an old, trustworthy church cookbook that I often used. It looked super easy to make and I figured I’d just take a chance and hope that it pleased my guy. Obviously it did, because I’ve been making that same simple granola recipe for the last 10 years! The thing that we love about homemade granola is that, at least for this recipe, it’s inexpensive plus it keeps us full much, much longer than store-bought cereal does. When my husband eats bought cereal, he literally has to eat half the box to get enough to keep him full until lunchtime. (He has a job that requires lots of manual labor, which obviously makes a difference.) With this easy homemade granola, roughly 1 ½ cups is all that it takes to keep him going until lunch. We also love that it’s a relatively healthy option, too! This recipe is super versatile and can easily be changed up to suit your tastes. Play around with it, add in other things that you love- make it yours! It’s very forgiving and is hard to mess up. I should warn you though that it does make a big batch. So if you prefer, you can always half the recipe. Or since it freezes well, you could also just make the full amount and freeze half of it! And of course, you can also use this yogurt to make homemade parfaits. This simple recipe works perfectly for them and makes them super easy and affordable. Mix everything but oil and vanilla in large bowl. (I like to mix it in my roasting pan and then just bake it in that). Add vanilla to oil, then add to dry ingredients. Mix well. Pour into oven safe dishes (if you don’t have a large roasting pan, cake pans work well) and bake at 250 degrees until lightly browned, stirring occasionally. * You can any kind of oatmeal you want as long as the total amount equals 16 cups. ** If you prefer a chunkier granola you can use ⅔ c. honey and 2 c. brown sugar. I was just thinking that I wanted to try making granola again! I've tried a couple recipes that I wasn't crazy about, but this one looks simple - and delicious. Darletta, it can definitely just be stored in any tight container. The only time I store it in the freezer is if I make up an extra recipe or two to save time later. Otherwise I just put it in my usual container and it has stayed fresh for at least a month. Obviously if you make it with butter, it probably wouldn't stay fresh as long. In fact, if you do use butter, then I'd probably just keep out a weeks worth or so and freeze the rest until you are ready to use it. But if you are using oil, you should be fine! This is almost like the granola recipe that I make! Sooo delicious! We always like it with butterscotch chips. I just saw this when I was getting my meal plan together this morning, and I knew I wanted to make it! I made it tonight, and I'm loving it! 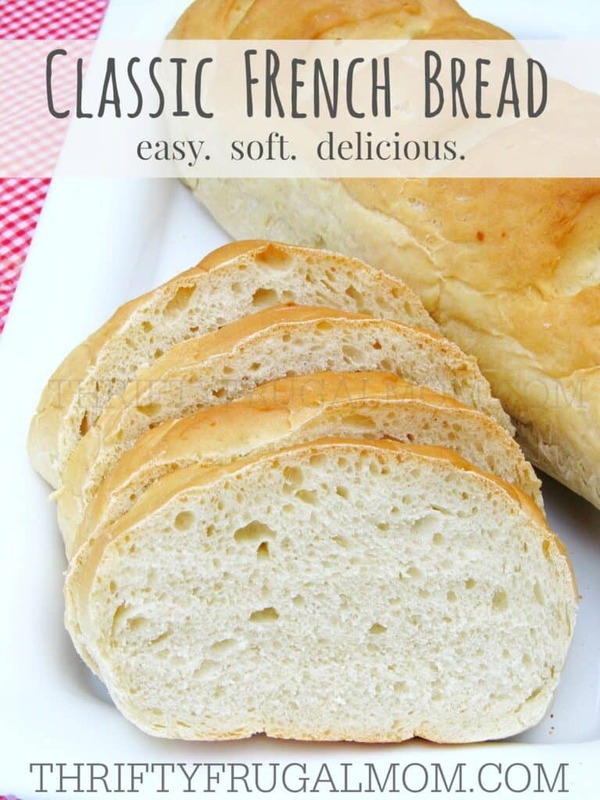 I love that it makes enough for weeks and is so versatile and tasty. Thanks, Lydia! Loving the granola! I must admit I'm not the best cook in the world, but this I can handle. Thanks for sharing. That looks delicious. I haven't made granola for awhile. I need to. Pinned it! Curious roughly how long it takes to get golden brown in a large roasting pan (uncovered, right?). Hmmm....not sure. It partly depends on how deep the roasting pan is and how often you stir it, but I would say roughly an hour maybe two? It probably sounds strange, but I honestly just put it in, stir it when I think of it and take it out when I happen to check it and it looks right. Because it is baked on such low heat, it's pretty forgiving and doesn't burn easily at all (unless you bake it in a super shallow pan). And because of my haphazard way of baking it and checking on it, sometimes it's a little more brown than others, but it's always yummy! Oh, and yes, you should bake it uncovered! How long do you bake it at 250 degrees? I'm thinking about giving your recipe a try, I love granola. Plus your recipe is simple enough for my kids to follow along...then maybe we can make this to give away for the holidays. Thanks ? The baking time varies on what size dish you bake the granola in and also how brown you like it to get. I bake my granola in a big roaster pan and so it takes longer than it would if I would use a couple of cake pans instead since they are more shallow. If you use cake pans, I would guess maybe an hour? As long as it looks lightly browned and isn't wet anymore from the oil, you should be good. If you use flake coconut you can also tell if the granola is done by seeing that is crumbly and dried out. It really is hard to totally botch....some of my batches are baked longer than others and more brown but unless you forget to stir it and leave it in for hours and hours and it burns, you should be fine. And yes, this recipe is a great one for kids to make. Our son started making it all by himself when he was 7 years old and has become my faithful granola maker. And I love the idea of using it for gift giving. So fun and personal! Dumb question, you serve this with milk or in yogurt right? Thanks! You are absolutely right, April! This is eaten like cereal with milk or you can use it to make parfaits and add yogurt and fruit. What add ins do you usually use? Thanks for the recipe. I have been looking for a good cereal. Assuming coconut is dried coconut flakes? Yes, you are right! I'll try to update the post making it more clear. I've used both actually, and don't really notice a big difference in taste either way. If you use sweetened and are concerned that it will be too sweet, you can always cut back on the brown sugar a little. I was wondering if you ever have used melted coconut oil? To replace butter or oil. I haven't, but this recipe is super forgiving and as long as you don't mind the taste of coconut oil, I'm pretty sure it will work just fine! I used both a cup of melted butter & a cup of melted coconut oil, since after my daughter & I made it together last week I didn't realize it used 2 cups, since I made it by myself this time I put 6 teaspoons of cinnamon, a cup each of butter(only had 2 sticks) & coconut oil, 2/3 cup of honey & all I had was 1 & 1/2 cups of brown sugar, we found that it had too much brown sugar in first batch. I like the taste. I had added about a cup with raisins & chocolate chips before it was cool & the chips melted. It was awesome. Thanks so much for coming back with the update! I love the changes you made. I've actually been adding less brown sugar too recently. I guess we are cutting back on sugar consumption and now just don't enjoy things quite as sweet as we used too. And the chocolate chips tossed in after baking? Such a great idea! Going to need to try that next time. This was so, so delicious! Thank you for sharing it. 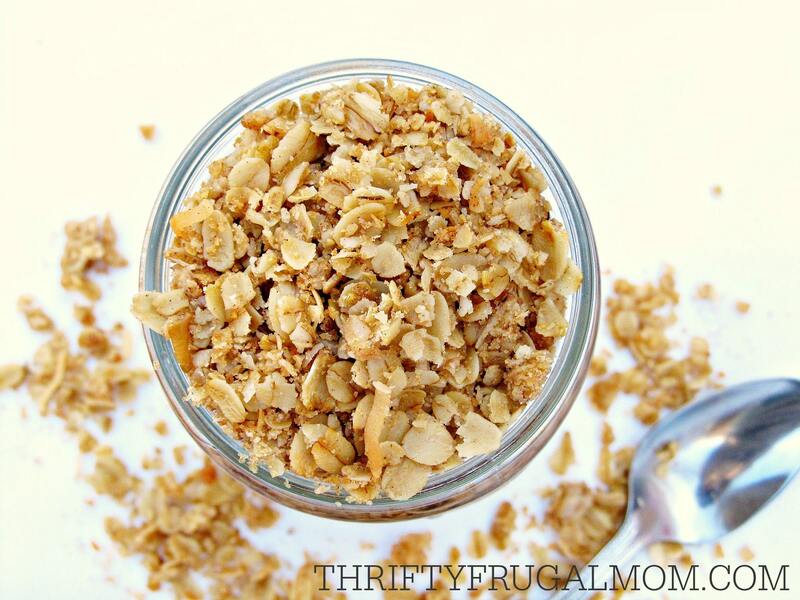 My 3 year old loves to top his yogurt with granola (we call it "sprinkles" instead of granola) :-) And this is so much more economical and healthy than store bought granola. Also, I personally LOVE very basic granola with no add ins or tons of stuff, so this is perfect. Sprinkles! That's so much more fun sounding than granola. I love it! And so glad you all are enjoying this simple granola. I hope it provides lots of happy breakfasts (or snacks) for you all!